An easement is a non-possessory interest in land that allows one person to use the real property of another person for a specific purpose. Easements can be either appurtenant or in gross, and can be created by deed, contract, or other written instrument. An easement deed should specify the location of the easement, the permitted use or uses, and the persons who may use it. In this state, a solar easement is an interest in real property which must be expressed in a written instrument that has been signed by the grantor. This is an appurtenant easement. An easement for the collection of solar energy can be created by a grant from the owner of the neighboring land to the owner of land on which equipment for the collection of solar energy has been installed or is planned to be installed. The written instrument must include a description of the burdened and benefited land, as well as the type of equipment that will be used (NRS 111.370). A conservation easement can be created in a similar manner. An easement deed should be signed by the grantor and acknowledged or proved in order to be recorded. 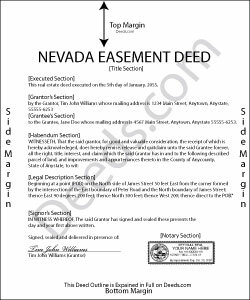 Acknowledgment or proof of an easement deed in Nevada can be taken before a judge or clerk of court having seal, a notary public, or a justice of the peace (NRS 111.265). To entitle the instrument to be recorded, it must also have endorsed on it or attached a certificate of the acknowledgment or proof of execution, signed by the person taking the same, and under the stamp or seal of that person (NRS 111.310). An easement deed should be recorded in the office of the county recorder in the county where the property subject to the easement is located in order for the instrument to operate as notice to third parties. If the easement deed is not recorded, it will be valid and binding between the parties to it (NRS 111.315). After an easement deed has been recorded, subsequent purchasers and mortgagees are deemed to purchase and take with notice (NRS 111.320).